Author(s): Kannughatta N. Shreenath, Department of Computer Science, Scholar, Jawaharlal Nehru Technological University, Anantapur, India. Krishnarajanagar G. Srinivasa. Background: Wireless sensor network has become very popular due to its wide range of applications such as environmental monitoring, precision agriculture, industrial site monitoring, target tracking, wildlife prevention and military applications. In most of the cases, the sensors are deployed in unattended environment. Sensor nodes are powered by batteries and frequent replacement of batteries is not an easy task. With this constraint, the sensor nodes must conserve energy and prolong the life time as much as possible. Methods: Many protocols are proposed at different layers to conserve energy. In this paper, we explore the current MAC protocols and propose an efficient MAC protocol for achieving energy efficiency using leader follower communication mechanism. Results: Through simulation, we prove the efficiency of the proposed solution compared to most used MAC protocols in wireless sensor networks. Conclusion: By using two MAC protocol stack, the proposed MAC reduces inter zone collisions and avoids intra zone collisions. By implimenting duty cycle as part of MAC protocol, we introduce sleep schedule to save idle energy. Keywords: Energy efficiency, MAC protocols, Sensor networks, TDMA. Affiliation:Department of Computer Science, Scholar, Jawaharlal Nehru Technological University, Anantapur, India. Keywords:Energy efficiency, MAC protocols, Sensor networks, TDMA. Abstract:Background: Wireless sensor network has become very popular due to its wide range of applications such as environmental monitoring, precision agriculture, industrial site monitoring, target tracking, wildlife prevention and military applications. In most of the cases, the sensors are deployed in unattended environment. Sensor nodes are powered by batteries and frequent replacement of batteries is not an easy task. With this constraint, the sensor nodes must conserve energy and prolong the life time as much as possible. Methods: Many protocols are proposed at different layers to conserve energy. 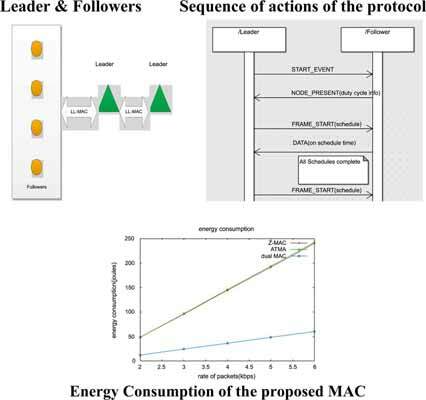 In this paper, we explore the current MAC protocols and propose an efficient MAC protocol for achieving energy efficiency using leader follower communication mechanism. Results: Through simulation, we prove the efficiency of the proposed solution compared to most used MAC protocols in wireless sensor networks. Conclusion: By using two MAC protocol stack, the proposed MAC reduces inter zone collisions and avoids intra zone collisions. By implimenting duty cycle as part of MAC protocol, we introduce sleep schedule to save idle energy.